The Heller MS in global health policy and management is an accelerated, nine-month program that will allow you to get back into the workforce quickly. The coursework spans two consecutive semesters (fall and spring). The core MS curriculum is divided into three main components. First, students learn the financing and payment systems involved in health systems strengthening. Next, they develop the analytical skills that form the heart of any health system, and use them to develop policy briefs. And last, they learn how to implement those policies in real-life situations. Students in the Health Systems Concentration take the full sequence of core courses and supplement their instruction with elective courses in a variety of focus areas. This concentration gives students increased flexibility to specialize in a narrow field, such as monitoring and evaluation, or to take a broad array of electives across many disciplines. Upon graduation, international students in the Health Systems Concentration will be eligible for Optional Practical Training (OPT) visa status of up to one year. This concentration is tailored to teach students the data and analytical skills that are key to fields such as pharmacoeconomics, health insurance planning, and impact evaluations. Students in this concentration take the full sequence of core courses as well as a curated selection of quantitative electives that will bolster their skills in health economics and analytics. The STEM concentration requires a significant amount of quantitative electives that will build skills in tracking, monitoring, and analyzing data across various health systems indicators, you may consider the STEM concentration. Due to the analytical nature of this concentration, it is recommended that you have a strong background in statistics, data analytics, and analysis. Upon graduation, international students in this concentration will be eligible for an extended Optional Practical Training (OPT) visa status of up to 2-3 years. All international students graduating from the MS program are eligible for 12 months of OPT. Students in the Health Economics and Analytics (STEM) concentration may also be eligible for an additional 24 months STEM OPT. STEM OPT is dependent on certain characteristics of your future employer. You can learn more about the requirements for eligibility to extend OPT through the International Students and Scholars Office (ISSO). Students may also opt to add to the MS skillset with a second program in international development, business, or conflict resolution. Heller offers several dual and joint degree programs, including an MS/MBA, an MS/MA in sustainable international development, and an MS/MA in conflict resolution and coexistence. Students in either concentration can also extend their MS curriculum by adding an optional second year of study, allowing you to expand your course work over an additional fall and spring semester. Heller is an ideal academic environment for students to establish the skills and expertise needed to build strong global health systems due to its interdisciplinary environment. Here, we recognize that global health and international development are integrally linked and rapidly evolving fields. In pursuit of improving global health, we believe it is critical for all MS students to gain an in-depth understanding of the UN Sustainable Development Goals and the WHO mandate for Universal Health Coverage. Associate Professor Diana Bowser describes two major benefits of Heller's MS in Global Health Policy and Management Program. One mission. A million motivations. 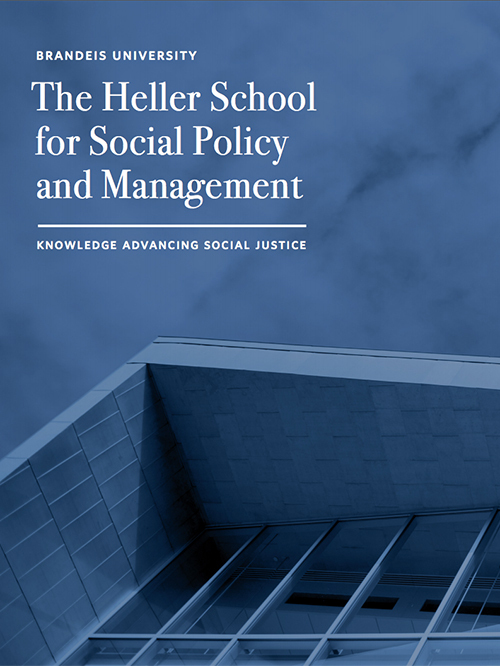 The Heller viewbook outlines those graduate degree programs in which you'll develop the broad knowledge and focused skills to serve the communities you care deeply about and have a positive impact on our society.